Admittedly, my favourite of the Fashion Weeks invariably tends to lean towards London's offering, and while such favouritism may be due to its more localised location to myself (and with that comes a more in-tune sense of relevance) the clothes unveiled on the runway are usually much more suited to my desires - although, it cannot be said with certainty that this pattern will persist throughout the current fashion week season as LFW is yet to commence and while I am eagerly awaiting its arrival (not just for the shows, but for street style too) until next week, the focus is on the ensembles exhibited on the New York catwalk, and such focus is pleasurable indeed. If one thing was consistent throughout the New York showcase of Ready-To-Wear - and whether that through presentation or on the runway - it was the intricate presence of layers (particular focus was had on the sleeve front) and striking detail which while in abundance, was eloquently executed in such a form which avoided the fussy. This such skilful attribute instead engendered an exhibit which was holistically rich in interest and appeal, and whether that be mastered through the glamour sequins of a Saint Laurent pussybow blouse, or the fulfilling ruffling feathers of a blue Michael Kors trouser - the attraction such adornments ensued did not wither or at all fail to keep the allure alive. The Proenza Schouler duo Lazaro Hernandez and Jack McColluogh created a collection which was born out of the concept of process, citing artists as inspiration for the reconstructed approach to tailoring, this idea of visible assembly is visually present in their desirable designs, adhering to the slashings of fabric and cut-away detail but note, this is not a deconstruction - it is mend and make. 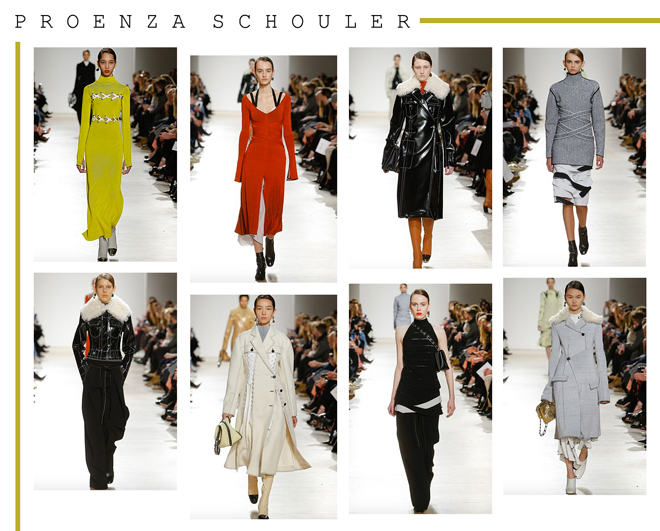 However, this mending process was not to a patchwork effect, the Proenza Schoulder way was fluid and succinct, but not to such an extent that made stitchings or linking adornments concealed - the mending process was one intended to be seen, and such made for a satisfying collection of contrasting yet flowing designs. A modern approach is the duo's course of action and it shows in the clothes, each garment oozes an air of relaxed temperament, but this does not mean that the clothing lacks in the element of interest, the layers may be of calm fitting but the overall effect is not one to be overlooked. 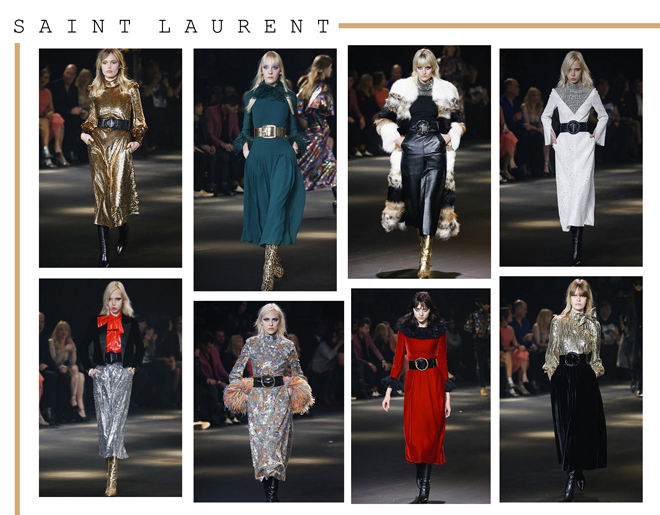 Hedi Silmane's excellence as creative director of the French fashion house is one that has seen rumours swirling of late predicting the end of his reign at Saint Laurent, and while such would be a great shame to the fashion world, his latest collection was by no means a disappointing feat. Think 70s glamour in all its sequined form, Silmane makes a penchant for reviving vintage classics and revolutionising them in a form that is fresh, current and exciting - take the pussyblow blouse for example, no longer of shirt consistency but comprised of glittering gold substance or patent red in its own right. In the collections entirety, a look was look and such was built through rich layers of plush fabric and deep colour - each sealed with a synching circle belt, fur or an accouterment of that 70s skinny scarf - not forgetting a long bold boot, no skin was on show here and like that Saint Laurent serves as serious fashion. An odd one for myself as never have I been one to seek much into the Michael Kors overload recent years have seen in form of common handbags and watches alike, yet this collection for me aroused a feeling unlike the tiresomeness I typically relate with the brand, instead, I felt the showcase was opposingly one of standout stamina. By stamina, I make reference to the seamless flow the clothes which, throughout the mixture of cuts and fabrics, stayed on constant course - a satisfying aspect that I feel that every collection should posses, it often goes hand in hand with the wearability factor of a Ready-To-Wear show, something which is indeed in the name but does not always translate through the clothing. In this case, Michael Kors Collection made a strong mark with an alluring pair of blue ruffle trousers, the feathers being a light yet distinct accoutrement featured throughout the collection and yet their effortless striking appeal does not differ no matter if such is paired with an equally ruffled blouse or standout sequin flares, it makes for a fascinating ensemble and a playful one at that, indeed it is timeless but that aspect of joy is not removed in these designs. In his own words the designer stated that the collection pays 'homage to individual style' and this is clear to see through such a collection consisting of items which are versatile in their sartorial nature allowing them to be adapted to fit each woman's personal preference. 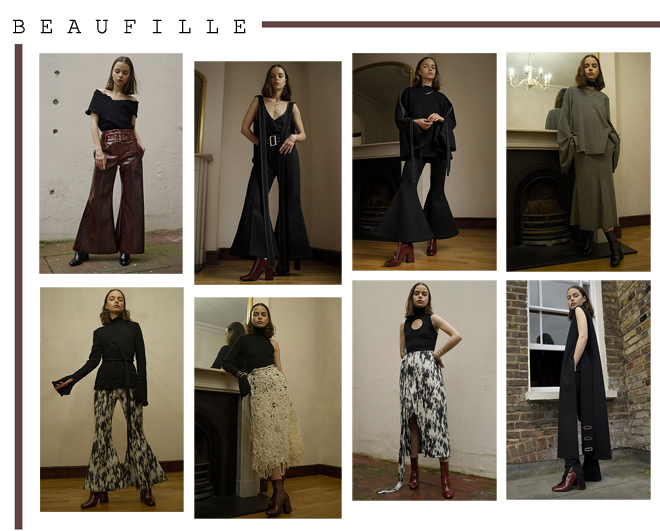 Beaufille, a relatively new Canadian label that I was unaware of until a look from their FW16 collection graced one of my favourite instagrams. The image displayed their unusual patent wide legged trousers to such a delight that the very picture spurred me on to discover more and it is fair to say that the entirety of the NYFW newcomer's presentation did not disappoint. With a name that translates to english as 'handsome girl' the clothes artfully convey this mixture of masculine and feminine through long, drawn out silhouettes accentuated with faint romanticised ruffles and striking cut-outs, although such are never too daring as to distract from the main body of the outfit. Overall the effect is a simple one yet at the same time it remains unique, modern and effortless almost but without seeming undone, a vibe that I am now wanting very much to emulate. Other notable mentions have to be the ever enchanting Rodarte in all its lace romance and Alice and Olivia with its colourful filled fun in straight up wearability fashion.